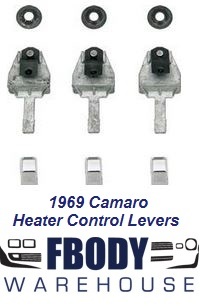 For use on 1967 - 1968 Camaro dashboard. This is a new replacement windshield wiper knob. Replaces worn or faded GM units this is a correct reproduction and the industry best replacement wise! 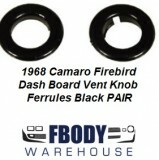 This is a pair of new replacement dash vent knob ferrules in BLACK for use on 1968 Camaro and Firebird models. This is a pair of new replacement dash vent knobs BLACK for use on 1968 Camaro and Firebird models. This is a 4 pc kitof new replacement dash vent knobs black & ferrules in BLACK for use on 1968 Camaro and Firebird models.